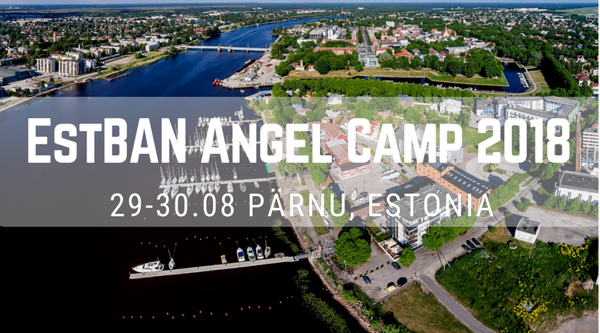 Angel Camp 2018 in Pärnu! (w/out accommodation) Billing with an invoice! We are expecting a good group of business angels to learn, discuss, socialize, network and participate. Topics will include syndication, cross-border investing, cross-border investment taxation, scaling the business, dealing with journalist and thoughts about Baltic Magic, with some outdoor activities and bar-hopping planned. EstBAN Angel Camp is powered by Startup Estonia, KredEx and the European Regional Development Fund ERDF. 10:30 Arrival, registration and coffee in Pärnu Beach Hotel (Rannahotell). What to do in Pärnu? Pärnu has a long beach that opens to the south and has lovely, almost white sand. It is a major Baltic seaside resort and the summer capital of Estonia. Raimond Restoran (Ranna puiestee 1) awaits you with fresh baked goods in the morning and delicious dishes for lunch. A pleasant dinner will end the day perfectly. Simple food made of local products grown especially for our seaside restaurant. The terrace, which opens onto the sandy beach, is as if made for romantic encounters of summer. Ammende Villa Restaurant (Mere puiestee 7) which ranked very highly on the 'Eesti Maitse 2013' list of leading Estonian restaurants and been awarded the title of Best Restaurant in Pärnu, Ammende Villa serves food made from fresh local ingredients. Pärnu Yacht Club Restaurant (Lootsi tänav 6) is located by the beautiful Pärnu River near the city centre and the beach. Everyone can feel great here because the beach and the river are always relaxing. In summer, the popular terrace of the pub offers beautiful views of the river and the yachts, the song of the wind in their sails adding some romance to the sunset. You're also welcome to improve your game at Pärnu's two golf courses, including the newest Pärnu Bay Golf Links, Estonia's Best Golf Course 2016 by World Golf Awards in Tahkuranna, just two kilometers from the city. Pärnu Bay Golf Links is a links course: a coastal stretch of land with sandy soil and fescue grasses - a true test of a golfer's ability. The course was designed by architect Lassi Pekka Tilander and it's the first links course in the Baltics. Pärnu also has a lively nightlife with number of clubs and bars both on the seaside as well as in the city center only a short walking distance from the hotel.